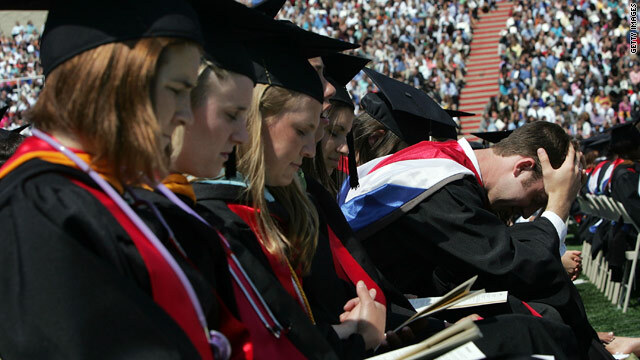 Washington (CNN) – Liberty University reacted over the weekend to a brewing controversy over the fact that the evangelical school has selected Mitt Romney, a Mormon, to speak at the school’s graduation. So what this says is they have no say ! Good luck in the real world ! You know something is deeply WRONG at a university when the students are MORE close-minded than the christian-rightwing administration. What could be worse than a university designed to create narrow-minded, brainwashed zeolots too brainwashed to even listen to other view[points? It's scary to know these graduates will be released into the world to spread their hatred and bigotry. Christianity is just another cult. They keep saying that the GOP will have to 'hold their noses' and vote for Mitt. I guess this is just aprt of the nose-pinching that helps that bitter pill go down, huh? Good thing the GOP's not a divided, bitter, fractured, negative, stubborn, narrow-minded, bunch of zealots, or Mitt would be in a lot of trouble come November... Maybe next time the 'big tent' will invite Huntsman instead. It's kind if like having the NRA endorse Mitt Romney without asking the honest to god opinion of their members, most of whom don't support Romney because he is untrustable. In this case their expecting a bunch of Catholics to vote for a Mormon (yeah right). I'm sure after Romney buys the school a new stadium they'll endorse him to. It's sad and pathetic. I wonder how much he paid CNN, FOX, MSNBC to ruin their journalistsic integrity. And what is Mittens going to tell these students while he imposes on their big day? "Nevermind the debt crisis our country is in, that your generation is going to have to pay off, you can still get a low rate on your student loans."? Reminds me of that commercial "even kids know". Mitt Romney LAUGHED about firing thousands of workers. What kind of Christian Man would laugh at the plight of his fellow man? b. A man who is no Christian at all. c. A man who is no man at all. Liberty University is to real higher education what deep fried wood chips are to food. In a sane world ANY candidate who spoke there would be presumptively be considered unfit for office. Liberty is a private Christian university, and they have every right to choose whoever they want to speak at their graduation. But the students ought to be ticked off that their Chancellor is cramming his politics down their throats. The Christians want to dictate to everyone. Control, control, control. Romney lies. They do not want to hear any more lies. @DumbasRocks- It's Liberty University. Being a close-minded Christian-Right Winger is an entrance requirement: the science classes teach that the Earth was poofed into existence 6000 years ago just like it says in the Bible. That's not a place that's going to attract a very diverse student body. I would imagine the "Chancellor" would be thrilled that the school's curriculum has been successful in raising new classes of uninformed, close minded bigots. Isn't this what the university was created for??? Forgot we are in 21st century? I say it again, somebody follow falwell. They will find dirt somewhere.